The most abundant steroid in animal fat is cholesterol. Yes, we do need cholesterol; it is a type of fat found in all of our body's cells. We need cholesterol in our body for it to function properly, but this should not come from our food; for the liver produces enough cholesterol on a daily basis, which is released into our blood stream to produce certain hormones, and vitamin D as the sunlight softly kiss our skin. Conversely, there is no cholesterol in any plant base food. The fatty acids in Plant-based foods are predominantly unsaturated fatty acids. Unsaturated fatty acids is a fatty acid in which there is at least one double bond within the fatty acid chain. 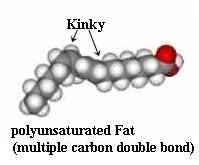 A fat molecule is monounsaturated if it contains one double bond, and polyunsaturated if it contains more than one double bond. 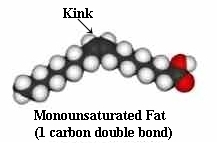 Due to the fact that unsaturated fat contains at least one or more double bond, whereas saturated fatty acids has non, unsaturated fatty acids have a lower melting point, hence they increase the fluidity and permeableness of the cell membrane and aid the absorption of glucose into the liver cells, fat cells, and muscle cells, where it is used for energy. Furthermore, Plant-based foods contain fibre and animal products do not. As soluble fibre is churned-up with the fluid present in the gastrointestinal tract, it forms a thick gel like substances which slows down digestion in the small intestine. This slow digestion process is what helps to regulate the release of glucose into the blood stream to stabilise our blood glucose levels. Therefore, whole foods should replace refined foods, and both monounsaturated and polyunsaturated fats should replace saturated fat in the diet, and trans fatty acids should be totally avoided. Replacing saturated fats with unsaturated fats and refined foods with whole foods will help to stabilise blood glucose levels, lower levels of total cholesterol and LDL cholesterol in the blood and rid you of your Diabetes.